Home Slider Sports Where will the Manchester derby be won? Where will the Manchester derby be won? Old Trafford will be at the centre of the football universe on Sunday when Manchester United face Manchester City in a crucial top-of-the-table Premier League clash. Second-placed United trail leaders City by eight points and must win to have a realistic chance of overhauling their fierce local rivals. Both United manager Jose Mourinho and City boss Pep Guardiola can call on a galaxy of expensive stars as they seek a potentially season-defining victory. Mourinho will believe he has the advantage between the posts after United’s David De Gea once again underlined his status as arguably the world’s best goalkeeper with a stunning display in last weekend’s win against Arsenal. The Spaniard made save after save, including a breathtaking double stop to keep out Alexandre Lacazette’s drive before regaining his balance to block Alexis Sanchez’s follow-up with his boot. After the calamities of Claudio Bravo and Willy Caballero last season, Guardiola has stabilised the goalkeeping situation at City with his £35 million ($47 million, 40 million euros) close-season signing of Ederson from Benfica. The Brazilian might not be in De Gea’s class yet but he is a solid shot-stopper and, just as importantly for Guardiola’s ball-retention philosophy, he has enough composure on the ball to start City’s attacks with his distribution. Both Mourinho and Guardiola have overseen solid defences, with United conceding nine goals in their 15 league games and City allowing in 10 over the same period. Yet the rival bosses have gone about it in entirely different styles as Mourinho currently prefers three central defenders and two wing-backs, while Guardiola has gone for a back four of late. It has not been all plain sailing and Mourinho might be worried after United trio Marcos Rojo, Victor Lindelof and Chris Smalling endured a torrid time against Watford and Arsenal. First-choice centreback Eric Bailly remains sidelined and Mourinho says Rojo is tired after recently returning from a long-term injury, meaning Phil Jones could return this week following his own injury issues. Vincent Kompany and Nicolas Otamendi are likely to figure at the heart of City’s defence, but Guardiola must be alarmed by the way City have conceded so often from set pieces recently. Right-back Kyle Walker and Fabian Delph, a midfielder converted to left-back by Guardiola, have both provided the attacking impetus required by their coach. 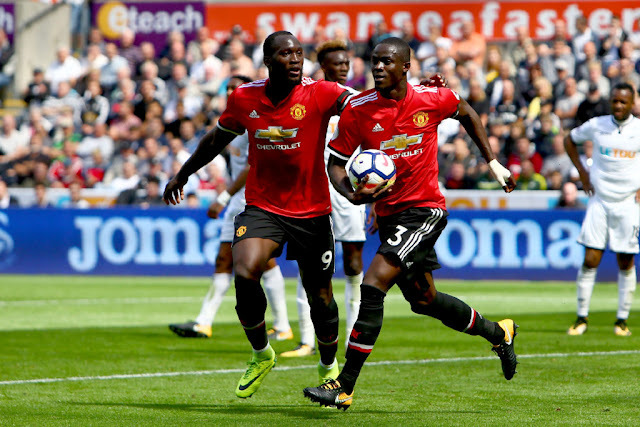 With Antonio Valencia and Ashley Young enjoying strong seasons in the wing-back berths and Nemanja Matic giving solidity in the holding role, United have established a strong foundation in midfield. Crucially however, Mourinho will be without Paul Pogba as he serves a suspension for his red card against Arsenal. With doubts over Marouane Fellaini’s fitness, Ander Herrera is likely to deputise for Pogba, but the little Spaniard will not be able to replicate the France star’s muscular power and ability to impose his will on games. Guardiola has an embarrassment of riches as he ponders how best to seize control in the vital midfield battle. Fernandinho has anchored City’s rearguard, allowing creative lynchpins Kevin De Bruyne and David Silva freedom to roam in attacking areas, though Silva could be a fitness doubt for Sunday. If De Bruyne and Silva are able to dictate the tempo, United could be in for a long and painful afternoon. After scoring 11 goals in his first 10 games for United, Romelu Lukaku hit a frustrating lean spell, so Mourinho will have been relieved to see the Belgian score against CSKA Moscow in midweek — just his second goal in his past 13 appearances. Jesse Lingard should start after his brace at Arsenal maintained the young winger’s impressive burst of form, while Marcus Rashford is unlikely to oust Anthony Martial on the other flank despite his goal against CSKA. If Mourinho needs to go for broke in the closing stages, the presence of Zlatan Ibrahimovic on the bench offers the chance to unsettle City with a more direct approach. Guardiola said he had learned a lesson when his introduction of Gabriel Jesus as a half-time substitute to play alongside Sergio Aguero helped City break down West Ham’s massed defence. Starting with both Jesus and Aguero at United would be a bold move but Guardiola has so many options he can keep Mourinho guessing until the last minute. Aguero’s 11 goals this season have made him City’s all-time leading scorer, but Jesus would offer more mobility if Guardiola plays on the counter. On the flanks, Raheem Sterling and Leroy Sane are both in top form, with England winger Sterling especially lethal in recent weeks.